People come in asking about cleanses. When it comes to the liver I always use this picture (the whole scene really) as a good example of how the liver can work. 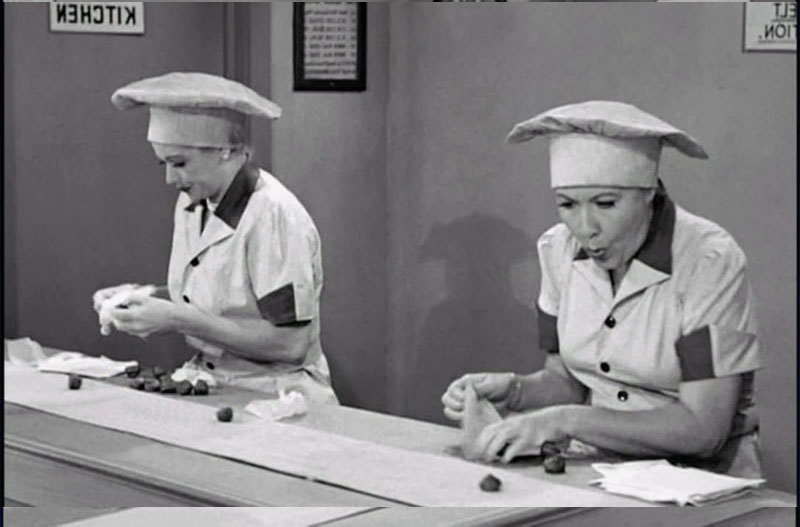 In this scene Lucy and Ethel get a job boxing chocolates… (think of them as the liver itself, sorting and packaging toxins and nutrients correctly to be either used, stored or excreted…) In the process they become overwhelmed by the amount of chocolates on the conveyor belt. This results in a hilarious thought process on Lucy and Ethel’s part in that they put them in their pockets, down their shirts and in their mouths to keep them from going off the conveyor… (think of this as the liver, if overwhelmed, will store the toxins in fat, or keep it in circulation where it can irritate the other tissues. Now, keep in mind the liver is an amazing machine that sorts and coordinates the distribution of nutrients and toxins. It is an amazing detoxifying laboratory and makes many of the things our bodies need to keep healthy… It is also a store house for sugars and vitamins we need. The idea to take from this is that when your system is overloaded or that your ‘liver’ does not work as well it can cause havoc and build up toxins in fat tissue that CANNOT be released until there is enough time and such for the liver. Clean out your conveyor belt by doing a fast, cleanse the colon and small intestine… it will get everything out of the system for a time and let the liver catch up. Do a liver cleanse (empty those pockets Lucy!) and clean up. A full cleanse takes time, but intermittent breaks are a great way to give the whole system a rest and improve its effectiveness. I have been using cleanses, prescribing them, researching them and combining them for over 20 years with really good success. Any cleanse you do is a good thing. Some require an amazing amount of time, and in my experience that is only sometimes true. A small cleanse is better than no cleanse at all. Cleanse: If you want, do any of the steps for three days, but stagger them, at least one day. So Day 1, salad, Day 2 salad AND bowel cleanse, Day 3 Salad, bowel cleanse AND Gall bladder cleanse. You can use the master cleanse throughout or do it at another time. Next day…. Bowel cleanse… (eat the salad or ‘stew’ as well today) Think of how many times a day you have a bowel movement. Go for three times that much over a day or up to three to really clean out. Think of how much food you eat each sitting, a handful? Two? Three? You should at least be releasing half that right? There are five OPTIONS choose one or two or do them on separate days… If they are strong, be careful with the dosage, it just makes the whole bowel release and it can be a doozy if you are not near easy access to the restroom. You have been warned… LOL (I speak from experience) Here they are listed from easiest to most aggressive. Senna tea: not as strong as the Cascara, you can use this frequently. This one is good for kids too. Vitamin C… 2,000 mg, then follow with 250 to 500 mg each hour until you get results. This is a good one if you are just hanging out at home. It is not too dramatic but release can be pretty voluminous. Cascara sagrada tea: This is strong, be prepared. It is a smooth muscle stimulant. You will get lots of gurgling and maybe even some cramping. That means it is working. Be strong, and fast. Magnesium Citrate: Get it at the drug store, strong too, but dosed well. Usually lemon flavored. This is well measured, the Epsom salt listed below is variable and more ‘powerful’. Gall Bladder cleanse, do a day of the bowel cleanse first… So this day, have the salad or stew, also do the bowel cleanse and THIS. Get ¼ cup lemon juice. Real is best, but do what you can. Mix and drink it ½ hour before bed. Lie on RIGHT side. Although some have more release from the bowel, and sometimes foamy, or ‘different’ some have no change at all. You may feel tingling or gurgling in the gut especially when lying on the right side. This is the gall bladder emptying. This will help get the liver to move bile through and clean itself out. Juice of 1 lemon or two tablespoons of Apple cider vinegar.